David Hume (1711–1776) was a Scottish philosopher, historian, economist, and essayist whose best known works include A Treatise of Human Nature, An Enquiry Concerning Human Understanding, An Enquiry Concerning the Principle of Morals, The History of England, and The Natural History of Religion. Born in Edinburgh, he attended Edinburgh University and lived for several years in La Flèche, France. Hume's work is centrally concerned with the psychological characterics of human nature and the foundations of human understanding and is characterized by a pervasive skepticism regarding received wisdom, religion, and other institutions. 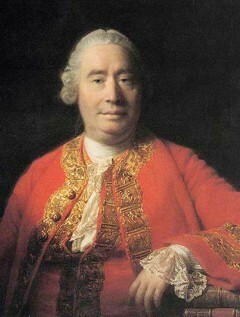 A towering figure in empiricist philsophy, Hume influenced writers including Adam Smith, Immanuel Kant, William James, and Jeremy Bentham, and his work is often considered a precursor to contemporary cognitive science.